With Infinite Arms, the third full length release from Band of Horses, a lock seems to have finally been placed on the revolving door of band members, resulting in a stellar, cohesive musical effort. Falling somewhere between 70's country rock and modern day alt-country, Band of Horses flow between back porch ballads and simmering rockers without ever going too far on either side. Every song has a distinct groove and Ben Bridwell's airy vocals maintain a yearning bite as they float above the rootsy foundation laid down by his band mates. It was a great idea for Infinite Arms to be released in May because this album was made for summer evenings when you want to barbeque with friends and hang out late into the night. Settling on that fine line between exciting and relaxing, it somehow makes time not fly by so fast so you can enjoy things just a little bit longer. Opening track, "Factory," sets the mood for the album with it's sweeping string section and it's soaring vocals, letting you know that the album is going to be as laid back as it is ambitious. The reverb drenched vocals may draw some comparisons to My Morning Jacket for some listeners but Ben's distinctive voice really shines on it's own. "Laredo" cranks up the energy without confusing it for tempo and has a lot of movement and momentum. The guitars and drums pulse without ever pushing the song out of it's zone. This song is a perfect accompaniment for a muggy June night, laughing with your friends on a back patio somewhere. Stripped down songs like "Older" and "For Annabelle" are great laid back gems and could've easily held their own on an old AM radio station back in the day. "NW Apt." rattles in just in time to make sure you didn't get too comfortable and then "Neighbor" calmly closes the album out with guitar, piano, organ and drums slowly fading into the night. 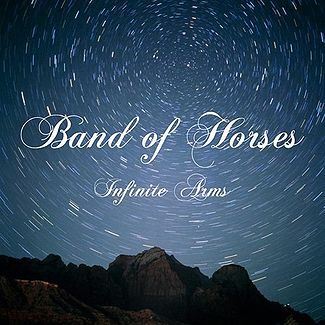 Band Of Horses have significantly grown and gelled as a group since their last album and Infinite Arms is a mature and fresh sounding offering created by a truly collective group effort.